Trump protesters blocked an Arizona highway preventing supporters from getting to a Trump rally. 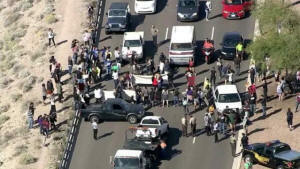 Anti-Donald Trump protesters blocked a major highway outside of Phoenix, Arizona Saturday, delaying Trump supporters who were driving to a rally for the presidential hopeful in the state capital. 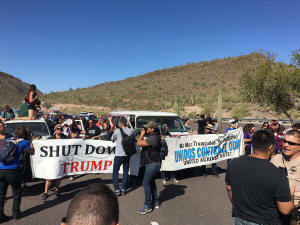 The protesters, carrying banners that read “Dump Trump” and “Shut Down Trump,” parked their cars and stood in lines across the highway, preventing traffic going towards the rally from moving and forcing police to begin rerouting traffic. BREAKING NEWS: Right now, protesters have shut down a highway heading to a @realDonaldTrump event in Arizona. Trump’s rally in Arizona brought particular attention from pro-immigration protesters. Maricopa County Sheriff Joe Arpaio, who has endorsed Trump, told Politico last week that he’d be providing security for the event. Arpaio is notoriously anti-immigration — a judge ruled in 2013 that the sheriff racially profiled Hispanics during immigration sweeps. The sheriff’s anti-immigration stance aligns with that of Trump, who has called for a wall along the U.S.-Mexico border and has compared Mexican immigrants to rapists. “He’s already talking about building walls, not bridges. In the modern era, that’s not acceptable,” Reza said. Meanwhile, in New York, hundreds gathered in front of a Trump-owned building in Manhattan to protest against the Republican candidate. 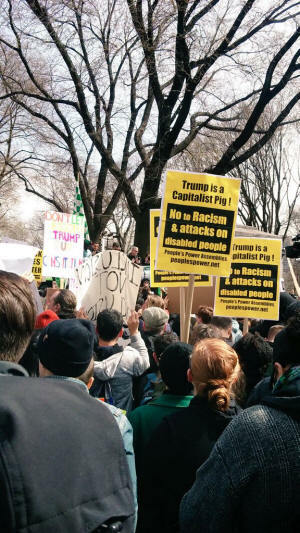 Trump is no stranger to protests at his rallies, and in multiple states, these protests have turned into violent clashes between Trump supporters and Trump protesters. Just a few days ago, Trump protesters marched towards the location of a Trump event in Utah, where several rushed the front door. Anonymous is encouraging fellow hackers and supporters to assist them in taking Trump down and dismantling his campaign. A new Youtube video was just released, from the hacker group Anonymous, stating they are now at war with Republican candidate Donald Trump. They will be attempting to shut down his website and expose any secrets they find that the public does not know about. “Your inconsistent and hateful campaign has not only shocked the United States of America — you have shocked the entire planet with your appalling actions and ideas. This is a call to arms,” the masked Anonymous member voiced. Anonymous is encouraging fellow hackers and supporters to assist them in taking Trump down and dismantling his campaign. “We are encouraging every able person with a computer to participate in this operation,” Anonymous said. This is the second time this vigilante hacker group has decided to go after Trump.